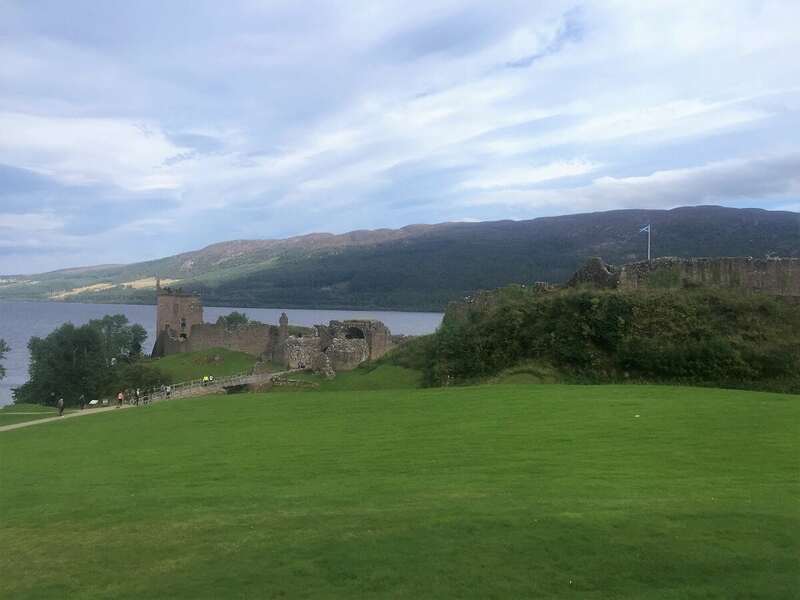 Most people travel to Inverness and Loch Ness to search for Nessie (the Loch Ness monster), but no visit to the area can be complete without a stop at Urquhart Castle. 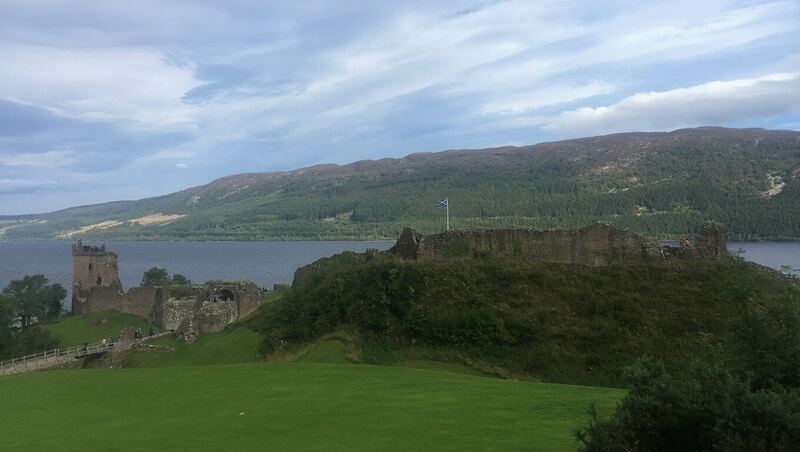 This castle on Loch Ness was once one of Scotland’s largest castles. It had an interesting history as the castle passed back and forth from the Scots to the English during the Scottish fight for independence. 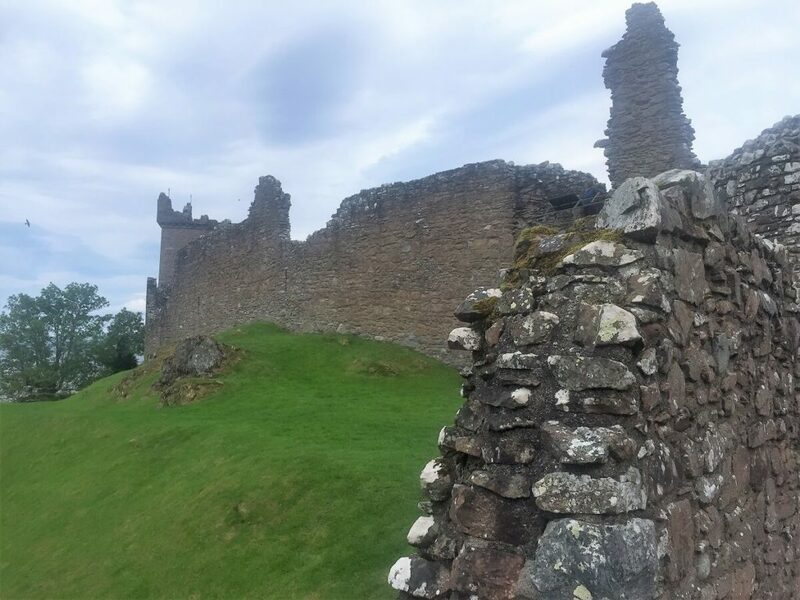 It’s fun to explore the Urquhart Castle ruins, learn about the fascinating history of the Anglo-Scottish Wars, and enjoy the stunning views of Loch Ness. 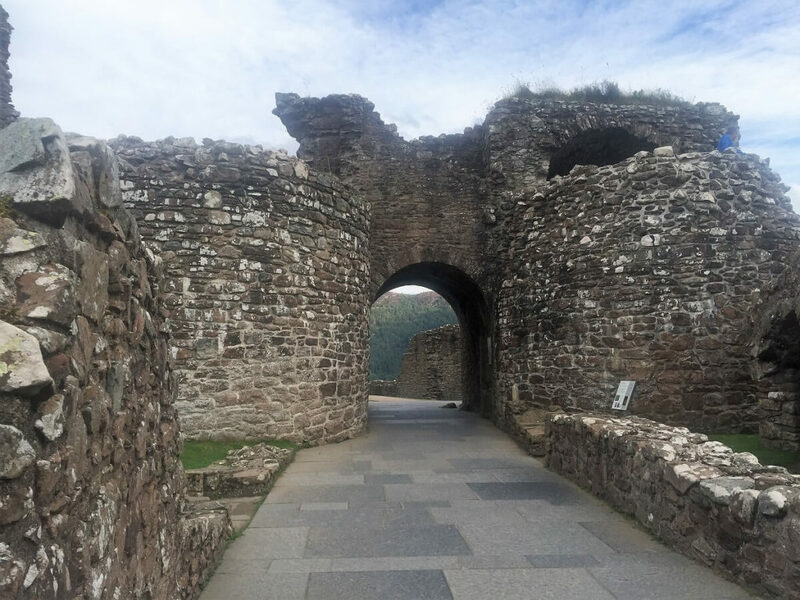 Let me tell you what you can expect when you visit Urquhart Castle and share some tips from my experience. Urquhart Castle first appears in the history books during the Wars of Scottish Independence in the 13th & 14th centuries, when it changed hands between the Scottish and the English several times. It was captured by Edward I of England in 1296 who appointed a constable to hold the castle at Loch Ness for the English. The Scots regained control two years later. England took the castle back in 1303, before being reclaimed by the Scots in 1307! Urquhart became a royal castle, held for the Scottish crown by a series of constables. In 1333, the Scottish were able to hold Castle Urquhart in spite of another English invasion. Although it was a royal castle, the only king to have stayed there was David II, who spent the summer of 1342 hunting at Urquhart. Note: The correct Urquhart pronunciation is ERK-ut. You can imagine how impressive the castle walls must have been. Over the next two hundred years, the area was raided frequently by the MacDonald Lords of the Isles, powerful rulers of a semi-independent kingdom in western Scotland, In 1509 the Castle was given to John Grant in perpetuity, on condition that he repair and rebuild the castle. Different Scottish clans battled over the castle but in the end, Grant regained the castle and was also awarded Cameron lands. Repairs continued as late as 1623, although the castle was no longer a favoured residence. When Oliver Cromwell invaded Scotland in 1650, he chose to build forts at either end of the Great Glen instead of using Urquhart. In 1692, the towering gatehouse was deliberately blown up so that the castle could never again be a military stronghold. Even though the castle is just ruins, there are some features that I wanted to point out. If you look at an Urquhart castle map, the walled part of the castle is shaped like a figure-8 creating two enclosures: the Nether Bailey to the north, and the Upper Bailey to the south. Before you go out to see the castle ruins, you visit the Urquhart Castle gift shop. Inside the gift shop, there is a small theater where they show a short film about the history of Urquhart Castle. Then when the film ends the curtain comes up and you can see the castle through huge windows. This is the first time you get to see the castle and the reveal is worth the wait. The view when the screen goes up is utterly breathtaking and makes the most of the amazing location of both the castle on the shore of the loch and the position of the visitor centre in relation to it. I thought it was one of the most spectacular ways of introducing a castle I’ve ever seen. There was an audible gasp when that screen went up. The view outside was like something out of a film set. On the path down to the castle, you will pass the Trebuchet. A trebuchet is a type of catapult that could throw massive stone balls. In 1998, two trebuchets were built here for a film recording. Although we know there were many battles here, there is no evidence that trebuchets were used against Urquhart but they did find 11 stone balls here. You pass by the Trebuchet on the way to the castle. The main entrance to Castle Urquhart. Coming from the gift shop you will pass through the 16th-century gatehouse of the Nether Bailey. This structure protected the main entrance, Urquhart’s defences weakest point. It has twin towers flanking an arched entryway. The passage used to have an iron portcullis and a double set of doors, with guard rooms either side. If an intruder managed to get past the portcullis, stones could be dropped on them through the “murder holes” in the wooden ceiling. Further ahead the way would have been blocked by two heavy gates. You can also go upstairs to see the rooms which may have been the living quarters for the castle’s keeper. Grant Tower is the main tower of the castle and named after John Grant, who was given a huge estate in exchange for repairing Urquhart Castle. The tower measures 39 by 36 ft and has walls almost 10 ft thick. The tower has 14th-century foundations, but what you see was built during the 16th-century reconstruction. It’s the tallest portion of the castle even though the southern wall collapsed in a storm in the early 18th century. The surviving interior sections can still be accessed using the circular staircase built into the east wall of the tower. Before the damage, there was a hall on the first floor, with rooms on another two floors above, and attic chambers. 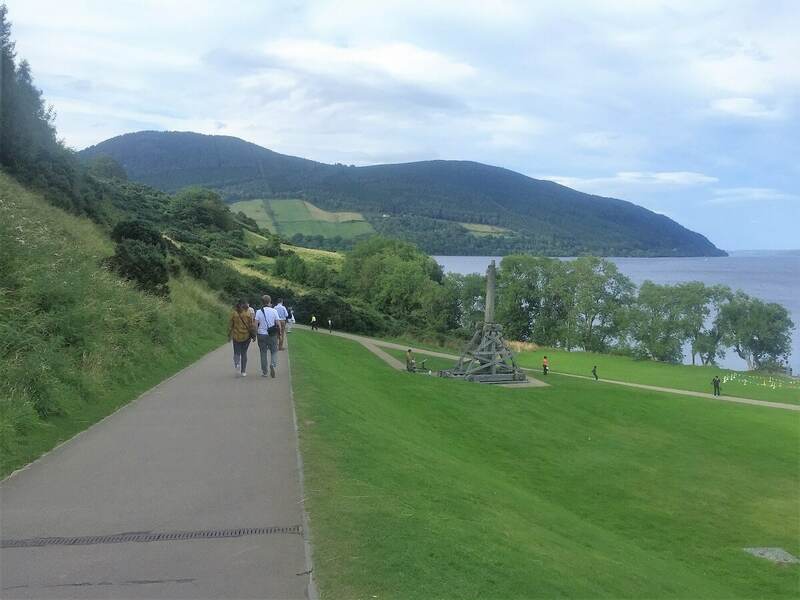 You can see the steps leading down to Loch Ness from the castle. You are right on the shores of Loch Ness, so it’s worth taking time to see the lake! You will see a gate (called the water gate) that leads to some stairs. If you go down the stairs it will take you right to the water. I put my hand in to feel the temperature of the water and it was cold. Russell wasn’t surprised by this and pointed out we were visiting the Highlands of Scotland in September. Of course it was cold! The Cafe has beautiful views of the castle and Loch Ness. We had just eaten so we didn’t stop in, but they do serve light snacks and use locally sourced produce. There are tour options where you can combine your visit to Urquhart Castle with a boat ride on Loch Ness. These tours allow you to stop and explore the castle on Loch Ness for at least one hour. The castle is located on the western shore of the northern end of Loch Ness, close to the small town of Drumnadrochit. Loch Ness is located 168 miles (three and a half hours of driving) from Edinburgh, which I think is a bit much for a day trip. There aren’t any hotels near Urquhart Castle. Your best bet would be to find a hotel in Inverness. Click here to see the hotel options in Inverness. We had a car so we just drove to Urquhart Castle and there is a designated parking area right there. 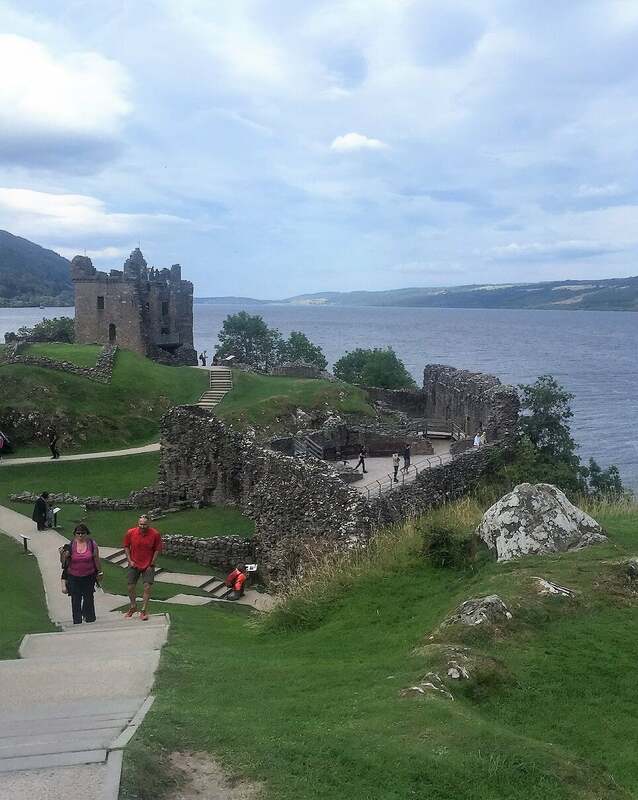 You can also take a bus from Inverness to Urquhart Castle – you can check the schedule here. If you are coming from Edinburgh, the drive is about three and half hours. 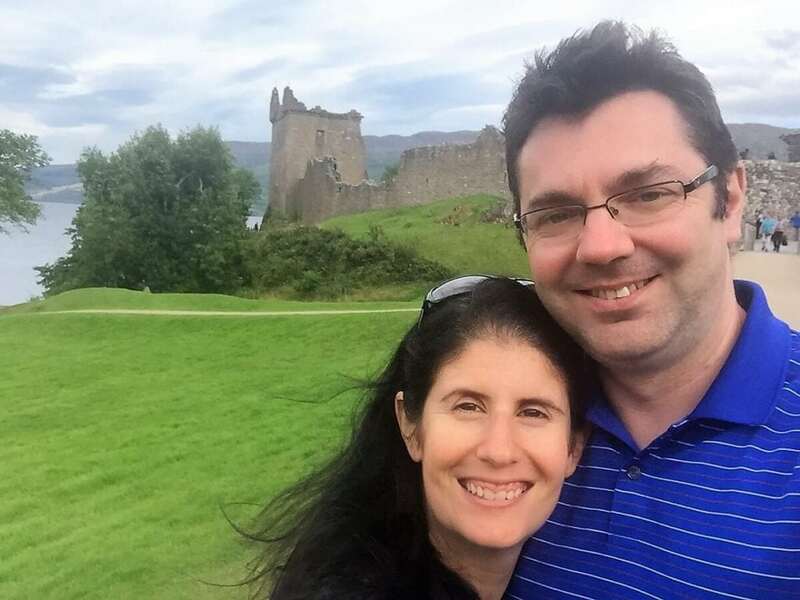 You can also take the train from Edinburgh Waverley Station to Inverness (which takes a little more than three and half hours) and then catch the bus from Inverness to Urquhart Castle. Urquhart Castle hours vary throughout the year. They open at 9:30 year around and close at 4:30 pm in the winter and 6 pm in the summer. In October they close at 5 pm. As of January 13, 2019, Urquhart Castle admission is £9 for adults and £5.40 for children age 5-15. Children under 5 are free. Urquhart Castle is included in both the Historic Scotland and Scottish Heritage Passes. The Historic Scotland Pass gets you into 77 top attractions in Scotland for either 3 or 7 days. Click here for more information about the Historic Scotland Pass. The Scottish Heritage Pass includes more than 120 attractions for 7 days. Click here for more information about the Scottish Heritage Pass. Both passes also included Edinburgh Castle. Check the website to confirm the hours and ensure there are no unexpected closures. I enjoyed my visit to the castle on Loch Ness. It was fun to explore the ruins and the setting on the banks of the Loch is spectacular. I enjoyed imagining what the castle looked like back in its heyday. Have you visited Urquhart Castle by Inverness? I would love to hear about your experience. Don’t miss the short film in the Visitor’s Center. The Inverness to Urquhart Castle bus is the best public transportation option. Check the schedule as it varies by season. 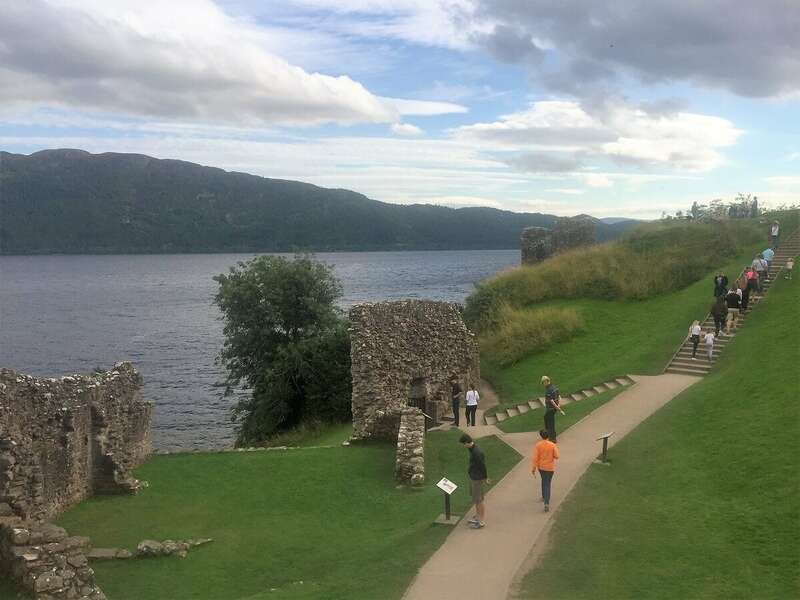 Consider taking an Urquhart Castle tour, it will include a boat ride on Loch Ness. Tanja – I love them too! I still need to go to Stirling plus several other Scottish castles. I also have a long list of English castles I still need to visit. Ushasita – Thank you. I love Scotland too and can’t wait to go back and see more. I love castles! I’ve always had a thing about wanting to go to Loch Ness to find the Loch ness monster. Scotland is up on our list, so I’ll keep this in mind. Did you find the Nessie? You should definitely go to Loch Ness. Our search for Nessie was fun, you should check out the video in my Loch Ness post. What lovely scenery! Too bad you weren’t able to get a shot of the Loch Ness monster xP The castle is now on my list of must-sees, thanks for all of the valuable information! Thanks Jessica, glad you enjoyed the post and I hope you get to visit Loch Ness. This looks incredible. It seems like you had decent weather as well. That trebuchet looks huge. We would love to make it to Scotland at some point. It looks like such a beautiful from everything we’ve seen and read. Thanks for sharing on #TheWeeklyPostcard! Haha Vicky! Happy to help build your list. Don’t worry I still have a hard time pronouncing Urquhart! I wish I had not missed this castle when I visited Loch Ness, but I did…If I ever go back, I will definitely be going here! Neha – I guess its a good reason to go back. Ruth – Its not an easy one to pronounce. We visited on our way to Isle of Skye so yes it works as part of a road trip. Anda – It is a fascinating story. I hope you get to visit Loch Ness. This is beautiful. I am going there sometimes this year, so it was great to know more. Lolo – I really enjoyed Loch Ness. I thought it was a beautiful area. I went o Loch Ness years ago (probably over a decade!) to see if I could find Nessie. I couldn’t but I do remember a castle there which I enjoyed. It must have been Urquhart Castle! Bryna – It must have been! Glad to hear you still remember it. You guys will love it. The pronunciation is not easy, I still have to remind myself or I will get it wrong! I love visiting castle ruins like these. It’s always interesting to see what has withstood time and the elements. it’s aso fun to imagine how it may have looked in its heyday. This is such a great one with the Loch Ness connection. Really need to visit Scotland soon. Mary – Me too. I love thinking about what it must have been like and how long its been around. You will love Scotland! I’m thinking of going here in the next few days so just found your post on it! I realised as I was reading that I don’t even know the history of it at all haha. Thanks for so much info! Clazz – You should definitely go! Even of its cold there is plenty to do.